Micromax today announced a partnership deal with Israeli based company Modu Limited (“modu”), to launch the co-branded and customized modu T phone in India. It is said to be the world’s lightest 3.5G touch mobile phone. modu T, a 3.5G touch phone was awarded a Guinness World Record for being the lightest touch mobile phone in the world. The phone has a 2.2” touch screen and memory card slot for external memory card (capability up to 32GB). The phone also features web access, Instant Messaging, direct links to different social networks, a built in FM radio, GPS, music player. It also includes applications such as YouTube, Google Search, Twitter, Facebook, Flickr, TuneWiki, eBuddy, Snaptu & operates on Qualcomm’s Brew operating system. The company claims that the “fy” devices provide an enhanced ecosystem, with many new functions added to the phone which gives users the freedom to choose, to change and to express themselves. Initially they will provide 2 “fy” devices that makes the phone multi functional and are working with modu to introduce more fy devices in the near future. The modu T phone will be available in India from 22nd October 2010 and will be launched with pre-bundled 2GB memory card and both “fy” devices under a special launch promotional offer for the auspicious Indian festival of Diwali. 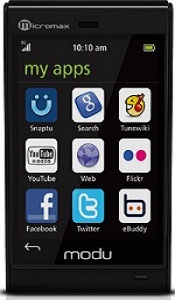 The phone also features 5 MP camera, Bluetooth, Music Player and FM radio. It is priced at Rs. 12,500.